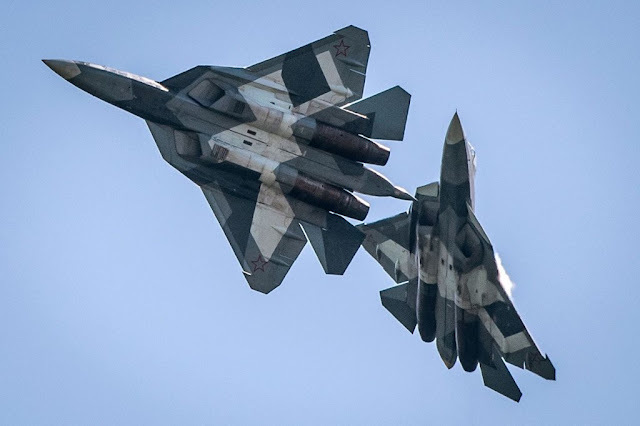 During the aerial demonstrations planned for the first day of the International Aviation and Space Salon MAKS 2017, one PAK FA fifth-generation fighter launched an attack while the other dodged it. A pair of Russia’s fifth-generation PAK FA fighter jets engaged in a mock aerial battle at the MAKS-2017 international airshow. One fighters launched an attack while the other dodged it, showing its super-maneuverability. According to the President of the United Aircraft Corporation (UAC), the company that produces the T-50, the delivery of the first 12 fifth gen. fighter aicraft is scheduled in 2019.